In view of the fact that African swine fever (ASF) was recently introduced into the wild boar population of the European Union and that classical swine fever (CSF) keeps reoccurring, targeted surveillance is of utmost importance for early detection. Introduction of both diseases is usually accompanied by an increased occurrence of animals found dead. Thus, fallen wild boar are the main target for passive surveillance. However, encouraging reporting by hunters and sampling of these animals is difficult. Partly, these problems could be solved by providing a pragmatic sampling approach. For this reason, we assessed the applicability of three different dry/semi-dry blood swabs, namely a cotton swab, a flocked swab, and a forensic livestock swab, for molecular swine fever diagnosis. After nucleic acid extraction using manual and automated systems, routine quantitative realtime polymerase chain reactions (qPCR) were carried out. 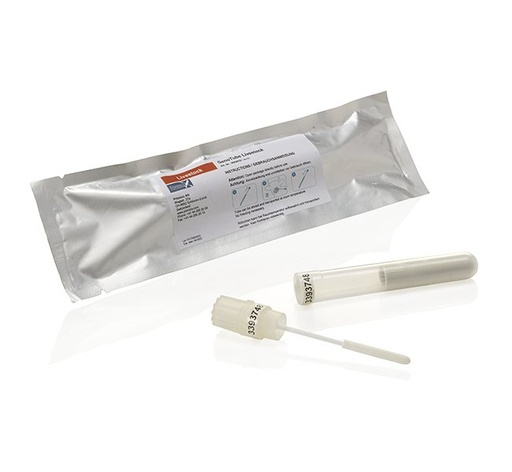 Results obtained from swabs or their fragments were compared to results generated from EDTA blood. It was shown that reliable detection of both pathogens was possible by qPCR. Shifts in genome copy numbers were observed, but they did not change the qualitative results. In general, all swabs were suitable, but the forensic swab showed slight advantages, especially in terms of cutting and further storage. Robustness of the method was confirmed by the fact that different extraction methods and protocols as well as storage at room temperature did not have an influence on the final outcome. Taken together, swab samples could be recommended as a pragmatic approach to sample fallen wild boar.